England begins its Guinness Six Nations campaign this weekend, kicking off the tournament in Dublin against title holders, Ireland. A win would give huge confidence to Eddie's Jones' team ahead of their home fixtures against France, Italy and Scotland. 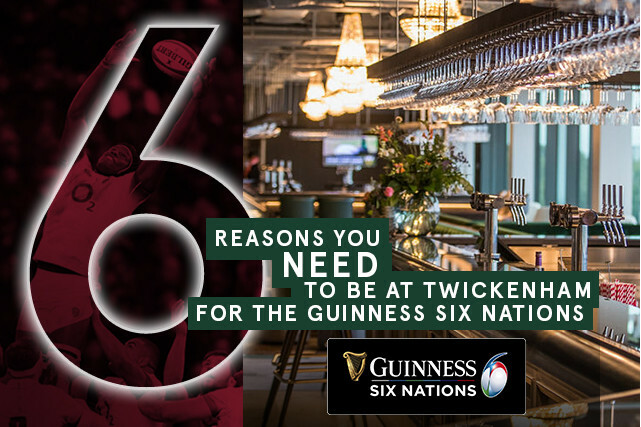 Find out why you should experience these games in the modern, stylish surrounds of Twickenham Stadium's world-class hospitality venues. 1. It's unmissable - The oldest rugby tournament in the world, the Guinness Six Nations sees Europe's top rugby nations compete in the most prestigious annual tournament. With a century of tradition, no rivalries are bigger and no prize is more coveted than the Grand Slam. Simply the hottest tickets in town. 2. Rugby World Cup - The tournament will be the last opportunity to see England play a competitive international before the squad head to Japan for the Rugby World Cup in September. Don't miss out on the chance to cheer the team on in this important year. 3. See new talent - be the first to view Eddie Jones' newly selected talent in action for England's game against France. Four uncapped players were selected for the England squad including Jack Singleton who features in our video for Twickenham's new East Stand hospitality facilities. Click here to view. 4. Calcutta Cup revenge - watch England in one of rugby's most historic international matches. England will be determined to regain the famous trophy, when Scotland visit Twickenham, having suffered their first loss in a decade in 2018 at Murrayfield. 5. Tom Kerridge returns - After a successful stint as guest chef in The Lock during the Quilter Internationals, the 2-Michelin starred chef will continue to partner with Twickenham Stadium for the Guinness Six Nations 2019. He'll design new menus for The Lock for the upcoming matches against France, Italy and Scotland with his team of experienced chefs at the helm in the kitchen. 6. Flexible pricing - With many superb and varied facilities to choose from, you will find a package to suit your style and budget. You can experience luxury hospitality for the England v Italy game with prices from £299pp + VAT. Whether you're entertaining clients, suppliers, friends or family, you can craft a package that will make your day right for you.